? 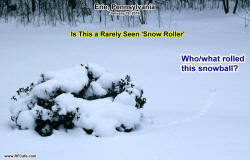 'Snow Rollers' Witnessed in Erie, Pennsylvania? Last month when I noticed a couple small snowballs in our back yard here in Erie, Pennsylvania, I remarked to Melanie that the squirrels must have been having a little fun the previous night. There were no foot tracks of any sort to betray the mischief maker, so it seemed like the neatly made snowballs must have come from nowhere. They could not have fallen from the sky, though, because there were clear ruts in the snow leading up to them. I took a couple photos and promptly forgot about them. Then, a couple days ago there was a news story put out by the Associated Press (AP) about a phenomenon called 'snow rollers' that had occurred on a big scale in Fairfield, Idaho. According to weather experts, snow rollers are considered a rare and 'unexplainable' occurrence where basically a necessary combination of temperature, icy base, exactly right snow consistency, and high winds take a small chunk of snow on the surface and sets it into motion. As it rolls along the surface, the clump accumulates successive layers of new snow, just as when a person (or perhaps a squirrel) rolls it for making a snowman or walls for a snow fort. It seems, then, that Erie may also be a place where the elusive snow rollers form. We definitely had the right conditions for it.